All rights reserved. Copyright © 2000 by University Press of Kansas. 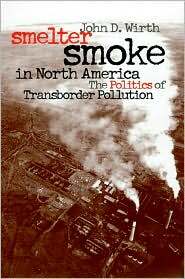 Wirth, John D. Smelter Smoke in North America: The Politics of Transborder Pollution. Lawrence: University Press of Kansas, 2000. John Wirth takes two case studies in order to investigate the transborder issues that arise when attempting to regulate air pollution. The first is the Trail Smelter dispute of 1927–1941, involving the owners of a Canadian smelter and the grievances of American residents, many of whom were farmers. The second is the Gray Triangle proceedings of the 1980s, which involved sites on both sides of the US–Mexico border and resulted in the closure of the Douglas Reduction Works in Arizona. Wirth argues that, whereas the settlement of the first dispute was actually favorable to industry (even with the establishment of the ‘polluter pays’ principle), the proceedings in the second signaled a shift in the direction of a more equitable balance between industry needs and the public interest. John D. Wirth (1936–2002) was Gildred Professor of Latin American Studies in the department of history at Stanford University. He co-founded and served as president of the North American Institute. Wirth also served as a US member on the Joint Public Advisory Committee of the NAFTA Commission for Environmental Cooperation.